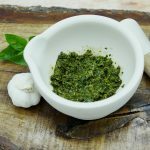 While I’m reasonably aware of the care taken in producing some Western sauces and condiments, my knowledge of how to identify quality in those used for Asian cooking was non-existent. 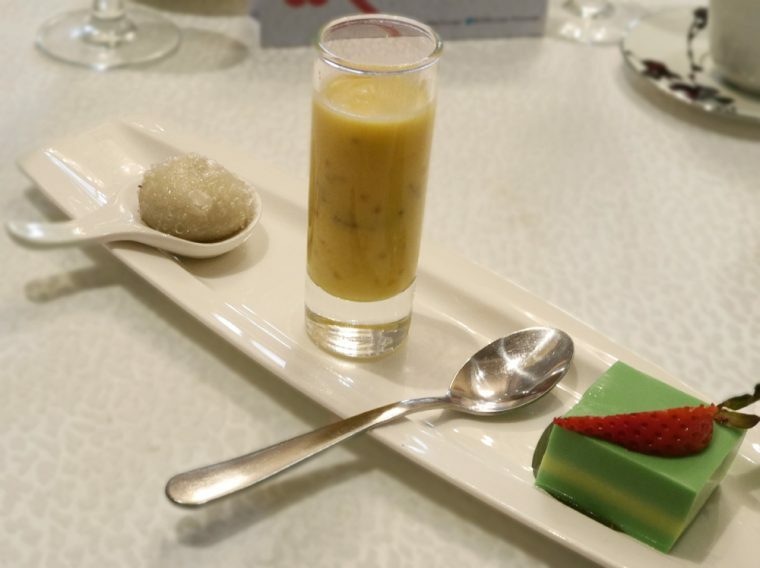 An eight-course Chinese feast hosted by Lee Kum Kee Sauces was an excellent way to learn a little more. I first came across Lee Kum Kee sauces when I spent a day at the School of Wok learning the basics of Chinese cooking. Our tutor took us on a guided tour of the shops in Chinatown and was keen to point out that not all Soy Sauces were the same. Light soy for cooking, dark only for dressing dishes…and always buy a quality brand. Lee Kum Kee was the recommended brand, though we didn’t go into detail about why. 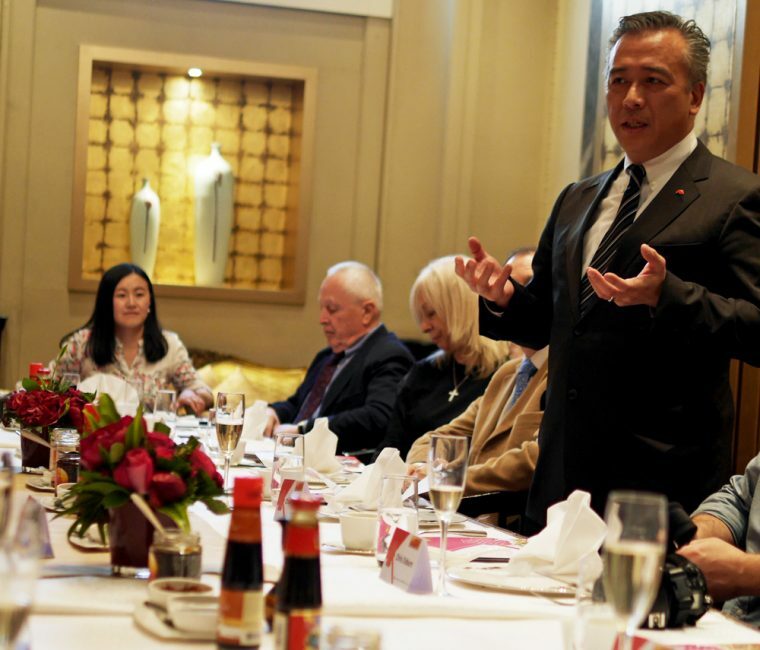 As our host, the Chairman of Lee Kum Kee, Charlie Lee, introduced the meal, he explained that 128 years ago, one of his relatives, restauranteur Lee Kum Sheung, had mistakenly invented oyster sauce. Forgetting the pot of oyster soup he was cooking, when he returned to the kitchen he found a thick deep gravy remained. Full of umami flavour, he decided to experiment with his new ‘Oyster Sauce’ with great success. 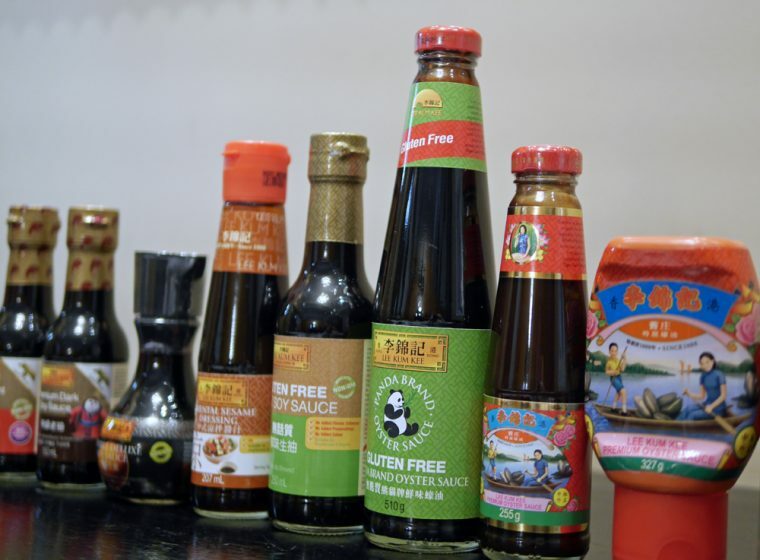 The sauce became phenomenally popular in Chinese cooking and formed the flagship product for Lee Kum Kee sauces. 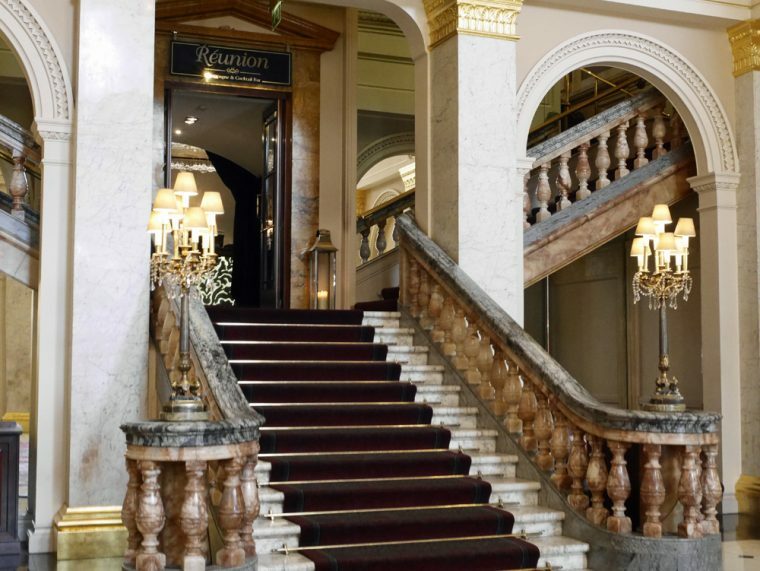 Our feast was a testament to the range of products, a showcase of Chinese cookery. 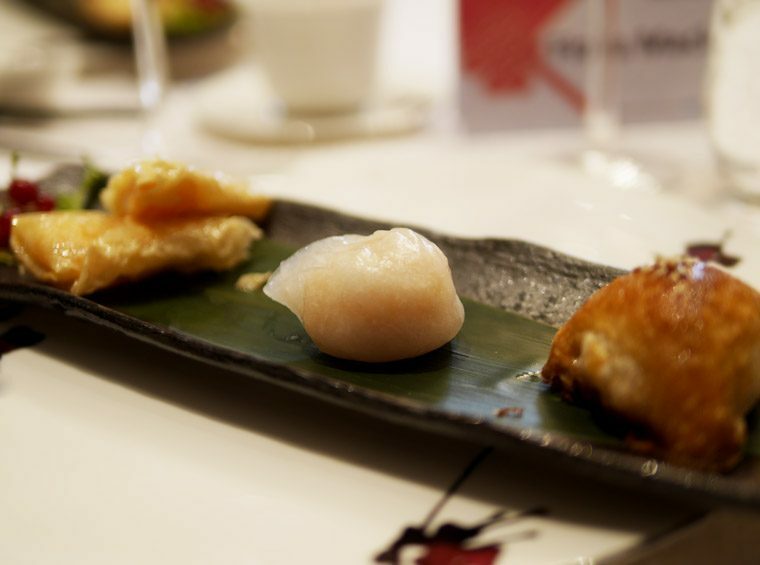 Starting with a Dim Sum platter, designed to showcase the three traditional ways of Chinese cookery (steaming, roasting and frying), we enjoyed a steamed prawn dumpling, a Char Siu pastry filled with barbequed pork and fried prawn spring rolls in a tofu skin. A small golden heap sat in a serving dish on the table. I would have guessed that it was caramelised garlic or shallots, but we were invited to add some to the prawn dumplings. It was XO sauce made with dried scallops, a delicious, slightly crunchy, fragrant seafood mixture that made a perfect accompaniment for the steamed dumpling. 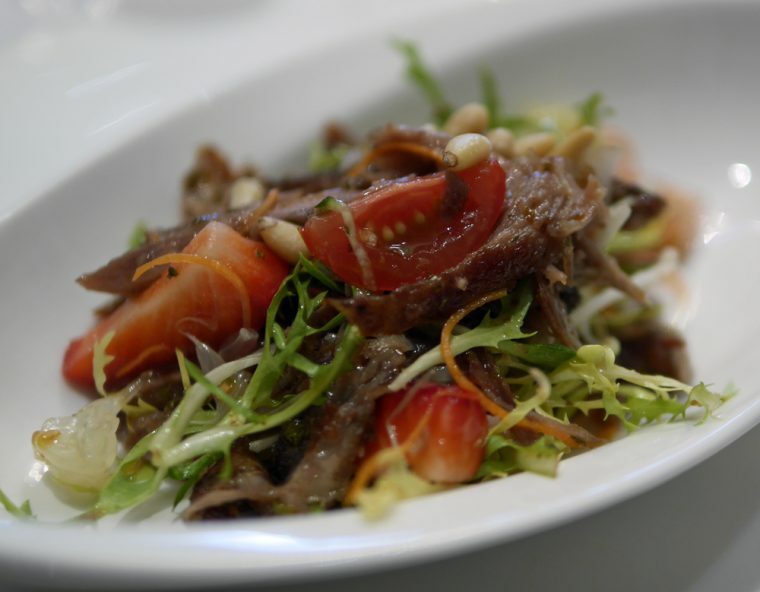 Next a large plate of crispy duck salad dressed in plum sauce, chilli, lime juice, lemongrass and mint. I love the way that the Chinese classic crispy duck with pancakes was updated, but thanks to the fragrant dressing still had echoes of the original dish. 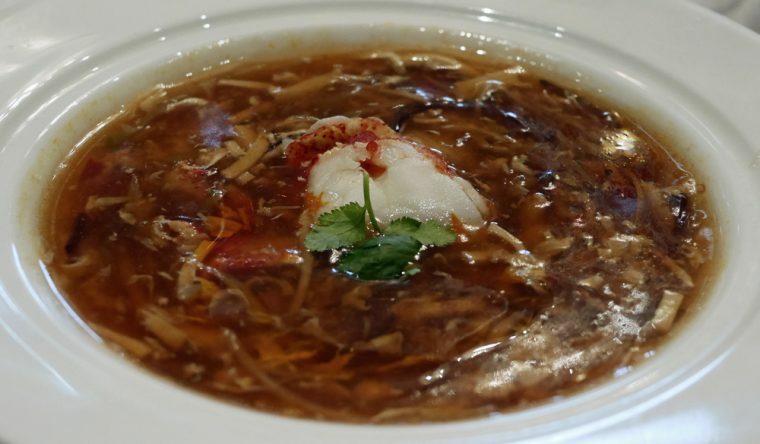 Szechuan Hot and Sour Soup with Lobster was a deep, rich mixture of colours and textures. The rich stock base was made from slow cooked chicken and pork ribs and the mixture had been dressed in bean curd, bamboo and a Chinese fungus before the addition of lobster tail, chilli bean sauce, chilli garlic sauce and Chiu chow chilli oil. Umami-rich, we learnt that the fifth element of taste was actually first identified in Chinese cuisine as xian wei. Steamed whole Scottish scallop served on a bed of glass noodles came with an invitation to add more of the XO sauce. 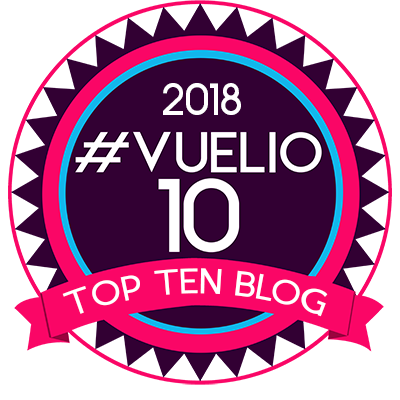 It’s something which is quite hard to find in the UK – though apparently you’ll find it in some of the Chinese supermarkets in Soho or for sale on Amazon! 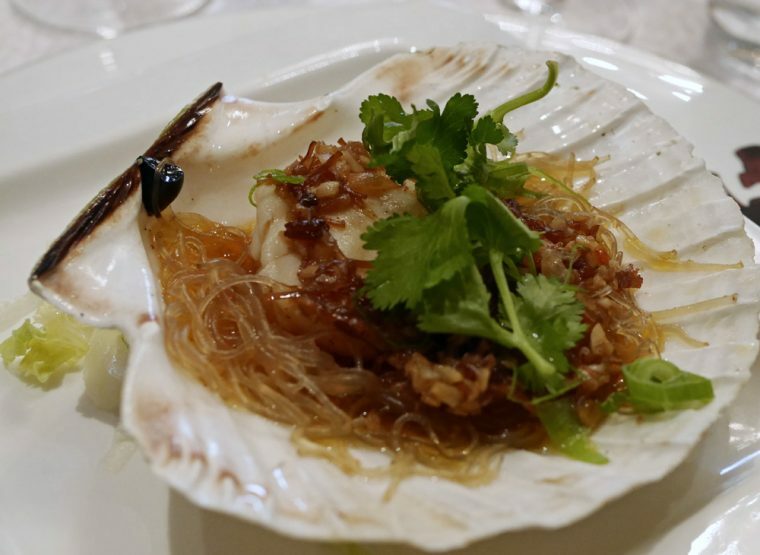 The whole dish was probably my favourite, I loved the perfectly cooked scallop with its fragrant coriander and XO sauce dressing – and glass noodles are a particular favourite of mine. A welcomed dish of vegetables appeared next. 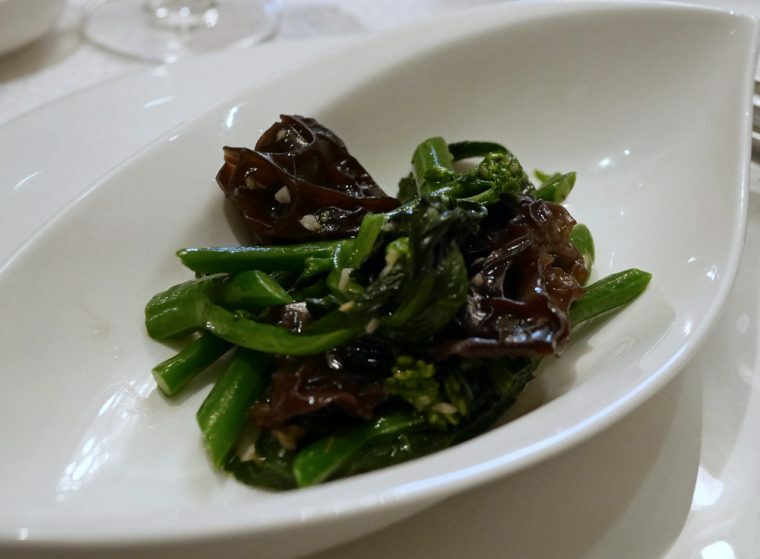 Kai-lan, Chinese kale or broccoli with Cloud ear mushroom served with garlic and ginger in a rice wine and oyster sauce. I suspect this is a dish I might attempt at home – the oyster sauce adding a richness and depth to the dish without any hint of bitterness. A beautiful plate of Scotch Beef fillet, served with shiitake and shimeji mushroom in a black truffle sauce was next. 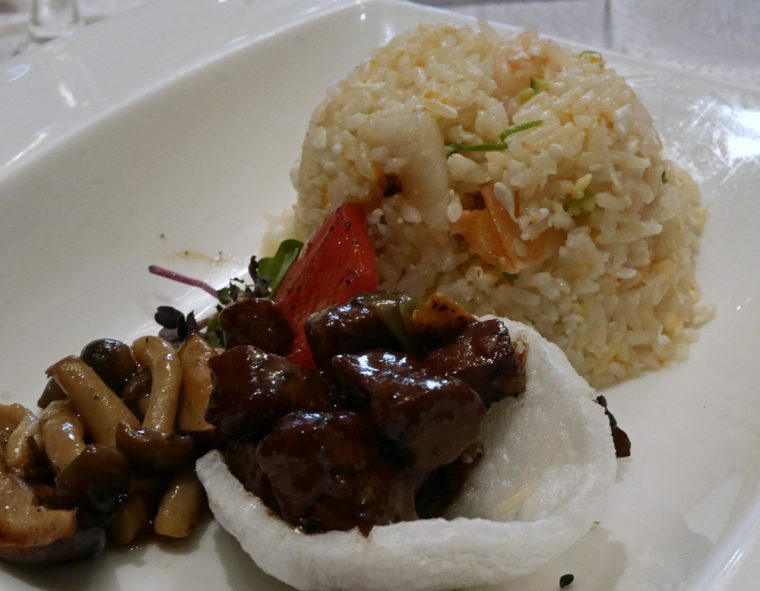 Served with a portion of delicate, special fried rice made with egg white and tobiko to create a light accompaniment for the beef. We left with a selection of Lee Kum Kee goodies to try at home – over the next few months expect to see my attempts at creating some Chinese style dishes. I’m delighted that I have both the authentic top quality oyster sauce that helped Lee Kum Kee to their original success and the XO sauce that we all raved about during the lunch. That is a feast!! What a way to experience the brand’s products too. I think it’s lovely that you have some ingredients to play with!! How fun!! This is one cuisine in which I fail badly to do my own. The new products might help you star in these dishes. I LOVE kim chee.